Barbara Timmermann (in yellow jacket at left), who heads the medicinal chemistry arm of our program, as well as KU pharmacy students (in blue T-shirts) were on hand for the planting event. This is not the first medicinal garden at the University of Kansas. In the 1920s, pharmacy students planted the “KU Drug Garden” near old Robinson Gymnasium on the Lawrence main campus. The garden honored their mentor, Lucius E. Sayre, the first dean of pharmacy at the University of Kansas. 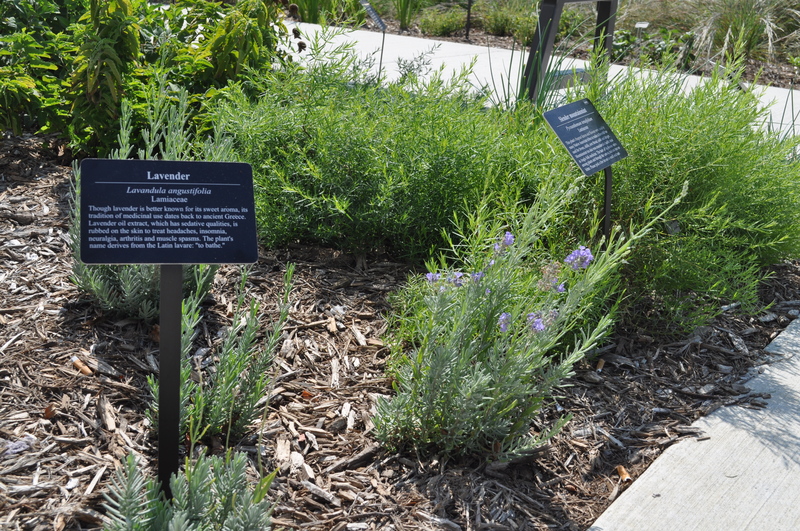 The pharmacy garden, made up of five themed beds, provides information on some 70 species of medicinal plants, many native to Kansas and the Great Plains. 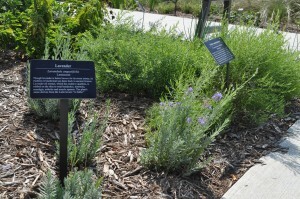 An extensive signage system provides information about the historical uses of each individual plant, about each bed and about the garden overall. (See plant list.) 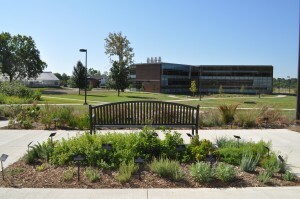 The garden was recently named the Heim Memorial Garden in honor of KU alumna Gail Heim, whose family has established an endowment for the garden in her memory. The five beds in the garden are described below. 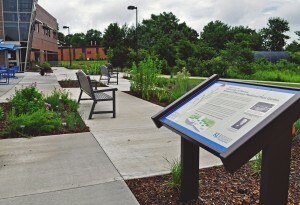 The garden is on the south patio of the KU School of Pharmacy, 2010 Becker Drive on west campus here in Lawrence. It is always open to the public. The pharmacy garden in July 2011, with the main sign installed. 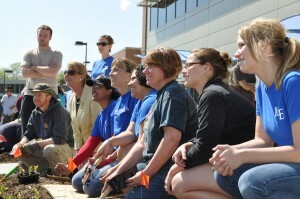 Heartland Plant Innovations Inc. provided funds to establish the garden. Signage was provided through Gail Heim Memorial Garden Fund at KU Endowment. 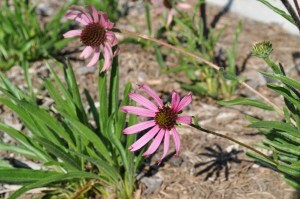 Echinacea tennesseensis in bloom at the pharmacy garden, September 2011. Butterflies pollinate all milkweeds. Monarch butterflies, which rely on milkweeds as food, are able to eat the poisonous compounds without being affected, and thus gain protective advantage: Birds that eat the butterflies become sick and learn to stop. Monarch Watch was established at KU in 1992 to track the North American migration of the Monarch. The program’s garden is just a few steps southeast of the pharmacy garden. The majority of the plants in this bed are in the mint family, Lamiaceae, which has more than 230 genera and more than 7,000 species. It is known for having many species with medicinal properties. Most of these plants are best known for their culinary value or their use in herbal teas. Thus, this garden demonstrates the intersection of food and medicine — for these natural, unprocessed foods provide us not only with nutrition but also with such beneficial substances as antioxidants, antibacterials and antiseptics. They not only taste and smell good, but they also help us treat headaches, coughs and colds; aid digestion; and relieve stress. This garden honors the vision of KU’s first dean of pharmacy: that all pharmacy schools would have a medicinal garden. It includes plants from KU’s first medicinal garden, planted in the late 1920s and known as the KU Drug Garden.Cotton in the Sayre bed; this plant was included in the 1920s KU Drug Garden. The tea and scented garden bed at pharmacy garden. In 1885, Sayre moved from Philadelphia to Lawrence, Kansas, to become the first professor of pharmacy at KU. In 1891, he was named the first dean of the new School of Pharmacy. His work centered on medicinal plants, and he was concerned about the safety and efficacy of medicinal plant use. Over the course of his career, Sayre authored more than 180 articles on such topics as the chemical analysis of medicinally active plant compounds, ethnobotanical use, market values of medicinal plants, alcohol Prohibition, and the standardization and purity of medicines and food. Sayre wrote pamphlets and textbooks on the study and vocation of pharmacy, including Essentials of the Practice of Pharmacy (1894) and A Manual of Organic Materia Medica and Pharmacognosy (1900). He also was known for his discovery of corn oil in 1913. 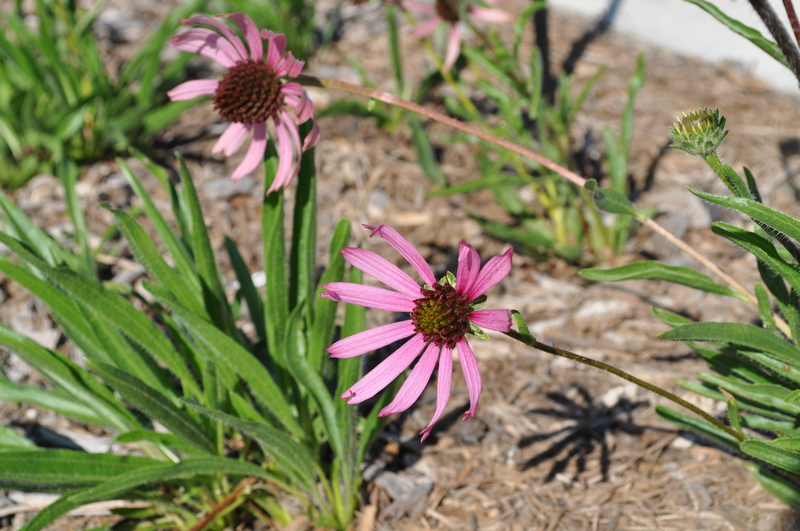 Sayre first campaigned for local medicinal plant gardens in the wake of World War I to reduce American dependence on the European plant market. 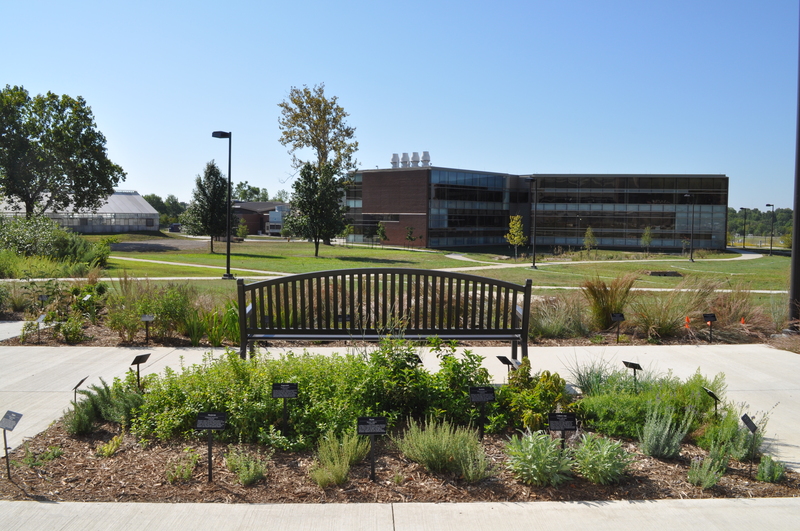 Between 1914 and 1916, the profitability of medicinal plants soared, which gave Sayre more reason to press KU for a medicinal plant garden at the School of Pharmacy. However, the university did not approve his proposal. It was not until 1927, two years after his death, that a medicinal plant garden was put in — one of many signs of pharmacy students’ fondness for Sayre — on the south slope of Mount Oread, near Old Robinson Gymnasium. Based on records in the University Archives, it is believed that the plants chosen for that garden were commonly used in medicinal research. Individual plant signs at the garden. With the 1906 Federal Food & Drug Act, USP and National Formulary (NF) standards were recognized as official standards. In 1975, the USP acquired the National Formulary and Drug Standards Laboratory from the American Pharmacists Association. Today, the USP is an official, nongovernmental public standards-setting authority for prescriptions, over-the-counter medicines and other health-care products manufactured or sold in the U.S. It also sets widely recognized standards for food ingredients and dietary supplements. These standards are recognized and used in more than 130 countries. Specific parts of many Kansas and Great Plains plants have been listed for medicinal use in the USP-NF, including all the plants in this bed. The fact that, of all these species, only Monarda fistulosa is still listed reflects the decline in herbal product use in the U.S. This information about the U.S. Pharmacopeia and National Formulary is from www.usp.org. This entry was posted on Tuesday, January 10th, 2012 at 12:14 pmand is filed under . You can follow any responses to this entry through the RSS 2.0 feed. Responses are currently closed, but you can trackback from your own site.